What you don’t know can hurt you. And what your heart can’t see, even with eyes wide open, can spiritually destroy. With that in mind, today, Ron Moore tests your vision and ignites your heart for God. Like sudden impact on weakened steel, pain can leave your heart bent and broken…especially when the impact is from your own hand. On today’s broadcast Ron Moore will help light the kiln that repairs shattered hearts. Loneliness is a cold, pain-wrapped gift. Inside its drab covering lies a bright purpose and smoldering hope. Today Ron Moore offers unwrapping instructions that will ignite that hope and illuminate God’s purpose in your life. The flames of victorious faith are not found in cool comfort. They are kindled in the difficult, dirty and disappointing lessons of life. But, as Ron Moore is about to share, once fanned those flames will ignite your heart and your world. 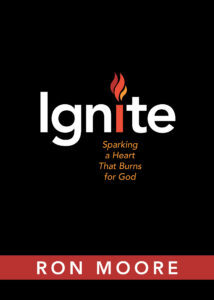 Take a brief look at Ron Moore’s motivating book “Ignite.” Ron leads you, step-by-step, on a spiritual journey to a heart ignited by grace. Along the way, he reveals God’s purpose in your stresses, pain, and tough times. By matching today’s struggles with King David’s tumultuous life, Ron paints a vivid picture of God meeting you wherever you are. He assures you that God is using your loneliness, brokenness, disappointment, and emptiness to fan the flames of faith in your heart. “Ignite” can be yours for a donation of any amount.